During July 2013, the University of Maryland's Engineers Without Borders (EWB) team made its eighth trip to Ethiopia in continued partnership with the town of Addis Alem. Since completing a community center in January 2010 as a first project, the town of Addis Alem (now Ejere) and Maryland's EWB team have continued forging ties together, offering engineering students the chance to take on real-world projects while also providing a practical benefit to the town. Now in its second phase of improving the town's marketplace, EWB spent a week in July assessing new ways to manage stormwater drainage, improve general sanitation, and construct more robust infrastructure that will culminate in a better market environment for both vendors and consumers. The team consisted of Civil Engineering Professor Barton Forman, professional engineer Ed Elder, Cathy O'Riordan, Ph.D, and students Yoseph Fehesa (aerospace engineering), Nicholas Valdez (civil and environmental engineering), and Abigail Henningsgaard (bioengineering). The team was led by senior civil and environmental engineering student Brett Jansen, who has been involved with Maryland's EWB team since 2010 and previously worked on design for the stormwater management system implemented in Ejere in January 2013. During the trip, the team met several times with Ejere's new mayor and other municipal officials to investigate the level of success of previous projects. Additionally, these meetings helped identify key areas of focus for improving the marketplace. Throughout the rest of the week, the team conducted several interviews with both consumers and vendors in the marketplace to better determine how best EWB can work alongside of the municipality in executing existing development goals for the market. The team also performed water quality tests on the local river and the water retention basin constructed in January 2013. Lastly, the team spent one more morning volunteering at one of Ejere's schools, teaching children and pre-teens basic lessons in water filtration and bridge design. As part of the Maryland EWB team's goal to continue improving how we receive and distribute information to our partner communities, the team successfully held a two-hour town hall meeting organized by the municipality and attended by approximately 50 community leaders, business personnel, teachers, and religious officials. Hearing from these constituents significantly helped EWB team members more holistically understand the community's needs and goals. Jointly led by Brett Jansen, Professor Barton Forman, and the town's vice mayor, the discussion reviewed each past project and received constructive feedback from the community on the project's effectiveness and how they could be better. Moving forward, the team will begin their project design phase this fall to create a master development plan for the marketplace. They hope to take a second assessment trip in January 2014. 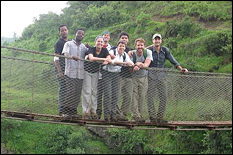 For more information on past projects in Ejere, please visit the project's webpage at http://ewb.umd.edu/projects/ethiopia-2012.